Extra Dry Champagne – This sparkling wine has a peachy flavor and is well balanced. Pinot Grigio Champagne – This has a fruity and vanilla flavor and would pair well with any spicy food. 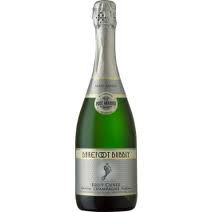 Brut Cuvee Champagne – ( This is the one I received ) This Brut Cuvee is tart and dry. 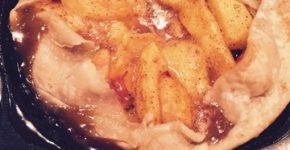 It has lots of sparkles with crisp apple flavors. 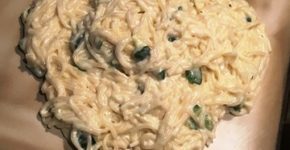 I served this with a simple Goat Cheese, drizzled with olive oil and crackers on the side. We loved it! Pink Moscato Champagne – This is a sweet sparkling wine with the flavors of cherry. Rose Cuvee Champagne – This, again, is a sweet sparkling wine. Barefoot Bubbly Brut Cuvee Champagne is a great option for easy and affordable entertaining. This wine is typically priced at under $ 10 a bottle. This is one of the leading products offered by Barefoot. This is their most traditional sparkling wine and can really be considered the flagship of the Barefoot Bubbly brand. So, let the holiday festivities begin! Pop the cork and get ready to toast the holidays and ring in the new year with Barefoot Bubbly! 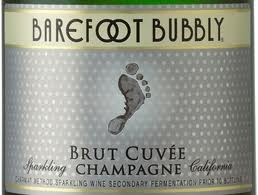 Note: I received 1 bottle of Barefoot Bubbly Brut Cuvee Champagne as a sample to be reviewed for our Holiday Gift Guide. No compensation was received. The opinions are honest and my own.